Few people succeed in their New Year’s resolution; in fact, roughly 88% fail in January. Why can’t we keep these commitments to ourselves when they will improve our lives? Examining common resolutions, will help you identify reasons for failure and better prepare you for accomplishing your goals in 2013. Vagueness prevents resolutions from being measureable. Promising to “eat healthy” leaves it open to rationalization. You could go vegan or substitute pretzels for potato chips. Either way you justify that you are “eating healthier.” Be specific so you can be honest with yourself. Instead of setting the bar at losing 30 pounds by March, try losing 8-10 pounds a month. You get to the same goal but you can evaluate progress along the way. Plan ahead and decide what steps are needed to be successful. If you want a better job, how will you market yourself? Is your resume up to date? Do you need more education? Does more money or quality of life constitute a better job? Developing a support system is also crucial to accomplishing your goals. Find a workout buddy for motivational reasons. It’s harder to blow off a workout if you let someone down other than yourself. These are things you must consider to get your resolution off the ground. Time is another important consideration. A 30 minute workout takes travel and preparation time; quickly turning into 2 hours. If you want to eat healthier, are you prepared for the time constraints to shop cook and clean? Many resolutions are going to require sacrifice in some other aspect of your life. Consider ahead of time how you will fulfill the requirements. Enlist the help of a professional. If you have no idea where to start, a professional can assist you with goal setting. Talk to a financial adviser, physician, pharmacist or personal trainer. Professionals help people accomplish their goals for a living, and went to school to do so. Do not hesitate to ask these people for assistance. 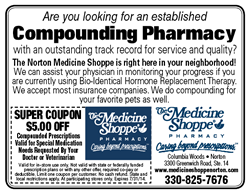 For help locally, contact your Norton Medicine Shoppe pharmacist and your Norton Snap Fitness personal trainer, who want to work together in 2013 to help you succeed in achieving your healthy New Year’s goals. They can help with weight loss, smoking cessation, diet and exercise planning. Best of luck with all your goals in the coming year.